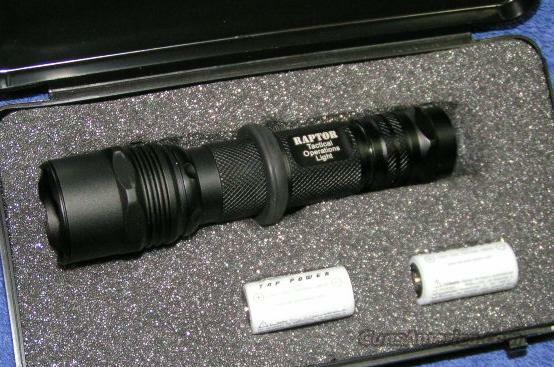 Description: Ledwave Raptor Tactical Operation Light with Storage Box. Handheld flashlight or mount on your gun with standard 1" scope rings. 5 1/4" overall. Black aircraft grade aluminum construction. Regulated 3 watt green LED with up to 80 lumen output. On/off tail cap switch with strobe option. Uses two CR123A batteries (included). Short battery life (sometimes less than 90 minutes). Plastic storage box. Lifetime warranty. I accept credit cards, cash, money orders, and cashier's checks. Paypal accepted too (no fee). Florida residents add 7%. $6 shipping. I combine shipping. Check out my other auctions. Rich.